Maze Rattan Winchester Rounded High Back Sofa Set: This classically styled sofa set can seat up to 4 people. 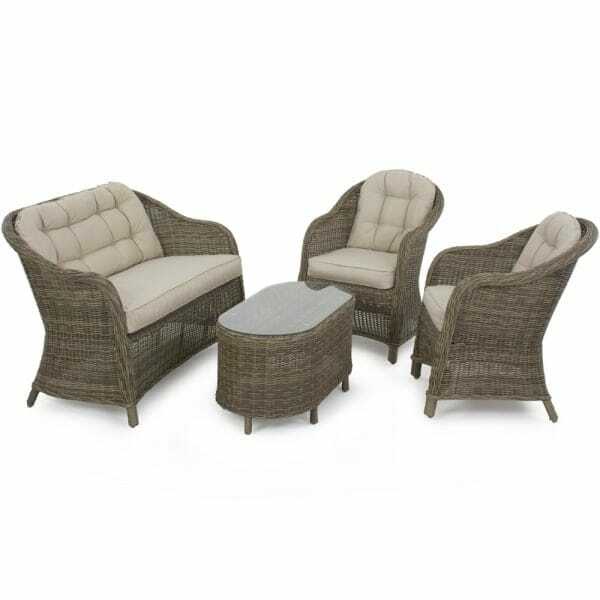 The curved design gives this set elegant lines and the beautiful rounded rattan weave will last for many years and can be left outside all year round. You can rest assured that you are buying quality furniture with the 5 year manufacturer’s warranty that is included with this set. This rattan sofa set consists of a 2 seat sofa with arms, 2 armchairs all complete with comfortable seat and back cushions and rounded coffee table with a tempered safety glass surface. This rattan sofa set would make beautiful conservatory furniture as well as garden furniture and is available in a natural rattan finish with complimentary cream cushions which can be sponge cleaned when required. This set is delivered fully assembled for ease, you will not have to waste time assembling this set you can start enjoying it as soon as it is delivered.